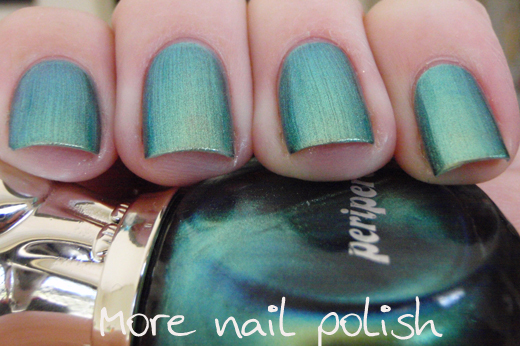 Rounding out my four Peripera polishes is the magnificent blue green duochrome that is Metallic Green. I really did save the best for last with this one. I believe this is also a dupe for Missha HGR001. It's looks a lot like a metallic foil, but it is slightly frosty, which means a few streaks. I really don't care about the streaks in the finish, because it is just so damn beautiful. This first photo is in the sun. 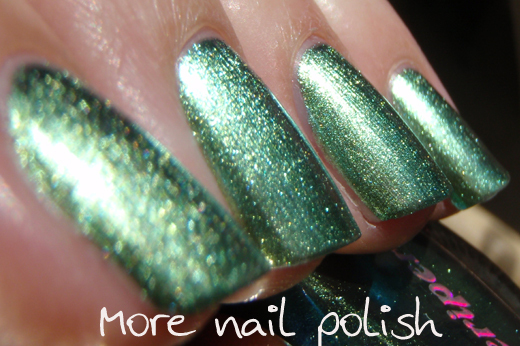 On the angle, you see the bright blue flash that this green polish shifts to. Taken indoors with no direct sun or light. Front on, indoors - with short stumpy ring finger which has now almost grown out to the length of the others in the two weeks since I swatched this. I tell you, these cat bottles are the cutiest thing EVA, but damn it makes it hard to hold your fingers in a level and attractive post for a swatch photo. After wearing it for a day or two, I thought I would try a star explosion, a la Nailside style. The idea was good, but my application terrible. 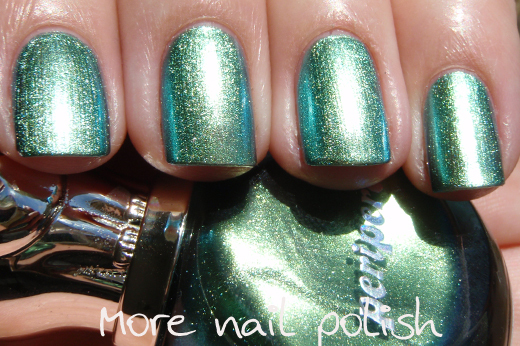 I loved the colour combo I did though, which was Tony Moly Neptune. I haven't got around to swatching (let alone wearing a full mani) of my Tony Moly's yet. I also mattified the whole thing to give it a totally different look. Stunning! I think this one is my favourite, too. Lol I just got this one myself, it is gorgeous, reminds me of a peacock! Wow, this is a beauty! And I love that Tony Moly glitter with this too. 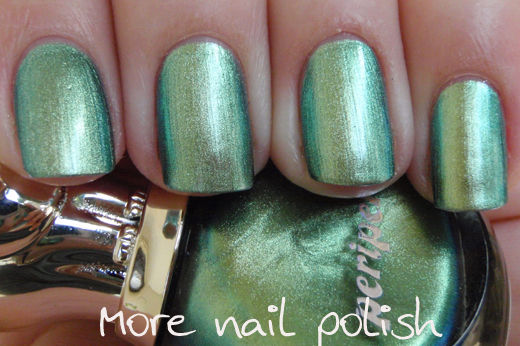 Green version of péridot, pretty! Soooo cool! Love it! Need it! Want it! That is soo cute, they taped matte idea really makes it more interesting too. 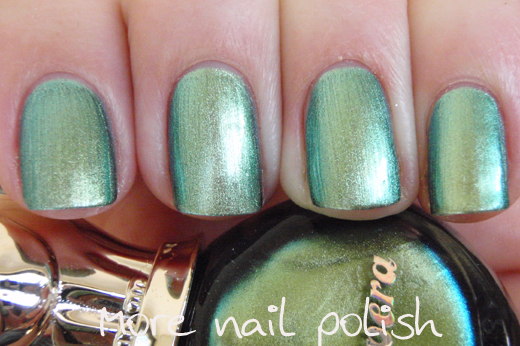 Wow I love this green! So awesome!! This is so pretty! 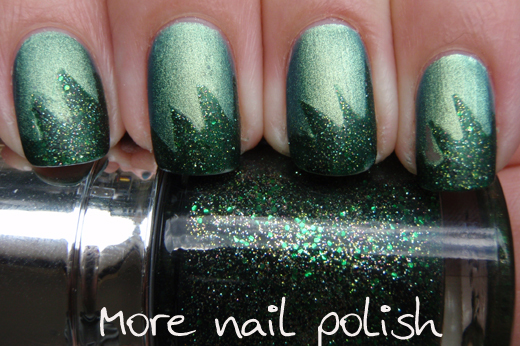 And i lov ethe nail art, too. Wonderful combo! I received my powders today! Thanks so much, you are amazing, girl! Three cheers for the Magic Fairy Dust Fairy! Gorgeous! Is this nail polish good for stamping?